Numerous Web sites and forums pay homage to the Lay The Draw strategy with prolific threads from supporters claiming to have found extremely lucrative 1×2 betting systems. Therefore, I have decided to explore lay the draw betting in detail using our HDA Simulation Tables and the popular betting odds Value Bet Calculator. Firstly, I will say that it is certainly possible to find a winning Lay The Draw system. However, it requires not only an excellent feel for the 1×2 betting odds market but also, knowledge of exactly what to look for and how to filter out a promising football betting system from a jumble of data. In this article you will learn the most common approaches bookmakers use to set their 1×2 betting odds, focusing on the draw odds. I will explore examples from the EPL and compare market prices with the ‘true’ odds. 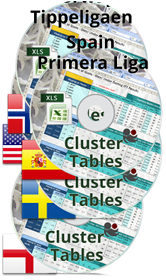 Using this knowledge together with findings from the HDA Simulation Tables, I will identify one team which looks very promising to lay the draw in each of its home league matches for the forthcoming season. In the last five seasons, if a bettor decided to lay the draw in every EPL match for a fixed risk of 10 units (fixed risk = limiting each bet to lose the same set amount; profit therefore fluctuates with each bet), a loss of 380.42 units would have been observed. The many red numbers in this table are difficult to ignore. Only by specialising in laying the draw consistently for the two Manchester clubs (City and United) when both (or either) were playing at home, would the bettor have seen a profit after five seasons (118.04 units for City; 143.85 units for United). A profit would have been rather unlikely if he had chosen a combination of any of the other teams. Including teams such as Fulham, West Brom, and West Ham when playing at home may have improved the chances of a profit but, their positive results after five seasons are not as promising as the two Manchester teams. For all the other teams scheduled to be playing in the 2013-14 EPL season (all those with a yellow background to their name in the table will be playing in the new season), there are only red numbers including Arsenal, Chelsea, and Tottenham, although their negative results are not quite so bad as the others. 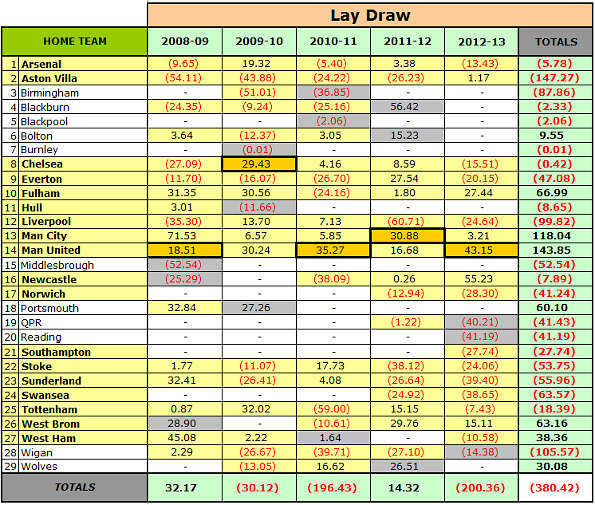 Why do Some Teams Bring Lay The Draw Profits and Others Not? To understand why some home teams bring a profit when laying the draw and others not requires a deeper understanding of football betting odds calculation. It is a hard fact, but true: There is no universal formula for successful football or sports betting in general. There is no rule that applies to every team and every market without exception which is always profitable to use. It is not possible to automate sports betting picks. You must look at each team individually and attempt to understand the bookmakers’ approach when they are setting odds. It is crucial to remember and bear in mind that bookmakers live from offering sports bets. They need to ensure long term solvency despite advanced computer technology, the availability of more and more raw statistical data, and the increasing mathematical awareness of their customers. The main business objective of bookmakers is ensuring profit, paying the bills and employees’ wages, and attempting to keep gamblers happy and entertained. Bookmakers’ football betting odds are mainly based on historical statistics and also on public opinion. Bookmakers need to balance their books so they are not exposed to losing considerable sums on any particular outcome. However, some teams neither obey their previous seasons’ statistical trends, nor comply to opposing teams’ statistics, or even to league averages. Some teams have a huge and unique home-field advantage; others just do not travel well. Whatever the set of factors involved in individual games the formulas which govern calculations of draw odds sometimes don’t reflect satisfactory market expectations. Of course, you cannot fully eliminate the chances that now and again a match finishes in a draw, but this is observed far less frequently than mathematical formulas predict or as indicated by the bookmakers’ odds. Sometimes, betting odds offered in the market are repetitively too low for some teams and therefore great value can be gained if one succeeds to identify them and choose to lay the draw whenever they play at home. You can see that Arsenal are a good example of a team that “more or less” sticks to the average distribution season after season. There were no major deviations except in the 2009-2010 season. This means that positive betting results for Arsenal draw lays are fairly unlikely. If you can remember the table on the previous page, Arsenal’s red figures now seem justified. Bookmakers therefore succeed quite well in pricing Arsenal’s home games and they are able to set the odds in a manner which, at the end of a season, show no great variations and the expected distribution matches quite reasonably the observed results. Laying the draw is a trading strategy, what’s the point of laying the draw and then letting it run? If you are going to do that then surely you would just back the favourite and not have the liability. The whole point of laying the draw is it limits risk, why not do a table of teams who have scored 1st at home and the chance was there to trade out for a profit? of course, you are right, there are millions of betting options combining ante post and live betting. However, we at Soccerwidow concentrate on explaining ante-post betting only, specialising on odds calculation. This article is just one example to bring a point across. We believe that without understanding ante post betting and odds calculation live betting is impossible and pure gambling (meaning – relying on luck only). Live betting requires very fast thinking and calculate probabilities as fast as lightening strikes. Thank SW! hope you will make some video tutorials like in youtube. Its a good content. 1st thank you for sharing your knowledge and for the in depth analyse and explanation. i want to know 2 things here in the screen shot (the last 25 last game stats and probabilities). 1 – for the home and away calculation Team1 and Team2. Is it the home and away game winning by T1 et T2 ? How did you calculate the draw ? only home draw for T1 and away draw for T2 ? also i struggle a little bit about to know how my prob.% and odds are good or not VS the bookie. “Best Odds” are the odds which are available to the individual. People use different bookmaker accounts, and some countries restrict access to bookies. Whatever you use (or can use) are your personal “best odds”.